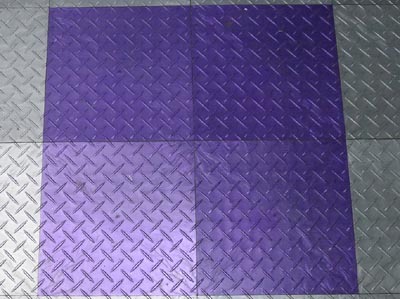 RaceDeck Interlocking Tiles (12"x12") - Purple (20 TILES) - diamond tread polypropylene tiles. New, limited quantities. RaceDeck flooring is backed by a 15yr manufacturer's warranty. $10 flat rate shipping per order. 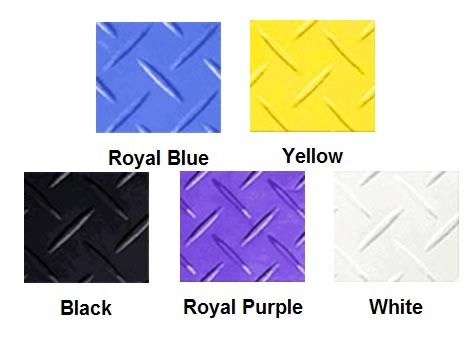 I have limited supplies of the following colors at similar close-out pricing.......Red, Royal Blue, Yellow, White, and Black. I have been using them under my garage cabinet installations as they protect the bottom of the cabinet from exposure to moisture and make moving the cabinets easier during setup. Note - tile photos are from my showroom floor and are a bit dirty. Tiles being sold are new and have never been installed.